new bouncy castles hire warrington. Here is our PINK Muti-play Activity Slide is a great attraction for any event! 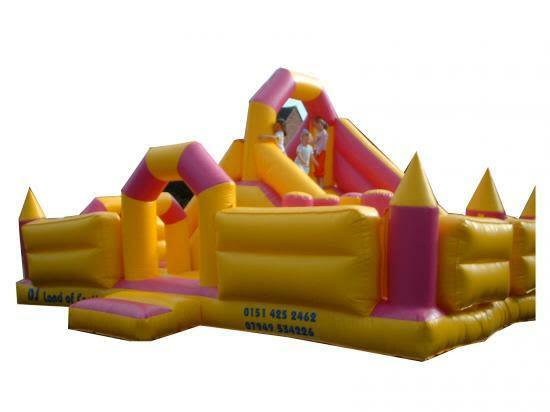 it is 15ft x 24ftX9FTChildren will love the adventage and challenge that they provide with this bouncy castle.This multi-play activity slide features exciting bish-bash obstacles,a scramball wall and a small inflatable slide.This bouncy inflatable is ideal fro school fetes,team building events,school hoilday camps,corporate events, fund-raising days, chsrity events and pirate parties..and many more so go on line and book today..We deliver our themed bouncy castles, inflatable slides,rodeo bull hire,plus are assault courses and adult bouncy castles and domes,to Merseyside & Liverpool, Widnes, Runcorn, Wirral,Warrington, and St Helens, and some of these areas and further areas will be a additional fuel charge or toll/tunnel charge.Check our delivery checker on our home page,it will tell you if there is a charge for your area.